Hi friends!!! I’m back in town and still on cloud 9 from the time spent with friends in Nashville. Behind the scenes my blog was undergoing some work so it was the perfect time to step away. I can hardly believe that Thanksgiving is next week. How in the world can that be? You know what that means. We are in full-blown holiday mode. 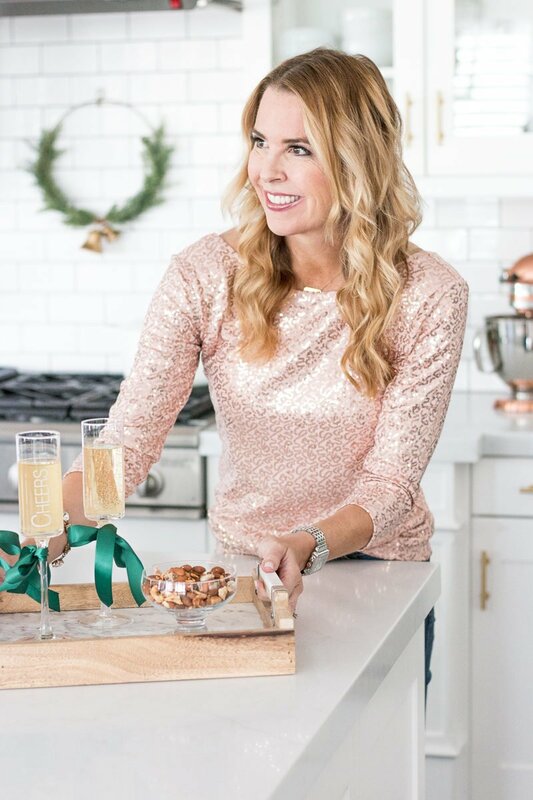 Things can get tense this time of year so I teamed up with Nordstrom and I am sharing five ways to avoid that holiday stress. Keeping it all in perspective and enjoying these next few weeks is of the utmost importance to me. Amidst the hustle and bustle, don’t forget to get real with your real friends. Invite them over for an easy, laid back night. Everyone can bring something. It can even be after dinner so there isn’t as much prep. Or invite your best girls over for a glass of wine and a fun wreath making night. Or just gather the crew for dessert. Whatever it is, just don’t let the “busy” take over and keep you from enjoying this season with friends. Having just spent a weekend away with my girls, I know how important it is for the soul. I’ve also realized that when I invite people over the entire house doesn’t need to be spotless. I clean the kitchen and the downstairs bathroom and call it good. Your true friends don’t care how the house looks. This top is so fun for the holidays. The pale pink is beautiful, but it also comes in black. Be sure to go down a size as it runs big. I am wearing the XS. If you would rather go out with the girls, swap the flats for the cute heels and your ready to go! The upside of hitting the town is that no cleaning is involved. By the way, these flats are an almost exact match to the sequin top. Life is hectic no matter how you slice it but the holidays can often exacerbate the stress. My husband and I realized many moons ago the importance of carving out a date night or two during this time of year. Sometimes we even sneak in an overnight away as our gift to one another. Regardless of how you spend the evening, just make sure it happens. It’s so much fun to go out and enjoy the holidays lights and music. This time of year flies by way to quickly and the whole idea is to stop and enjoy it with people you love. If you can’t get a sitter, then spend a date night in but be sure to make it special. 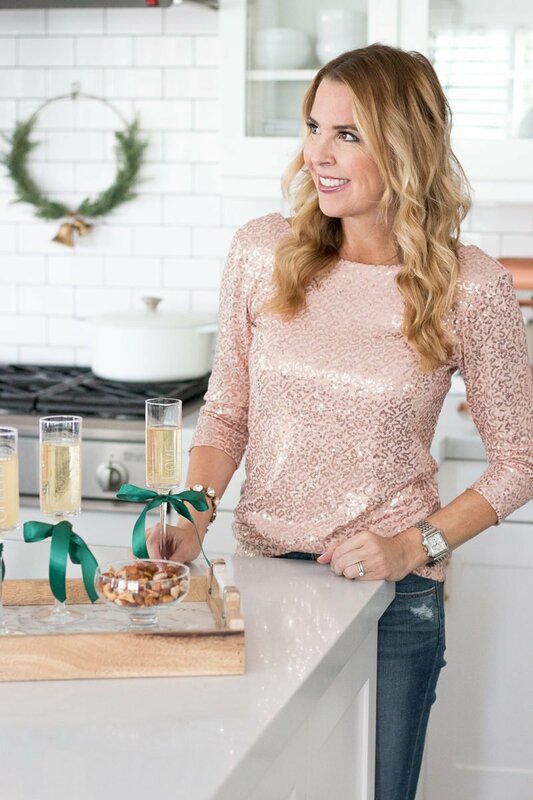 This top is perfect for upcoming holiday parties and events. I love it with the tulle skirt but it’s darling with a pair of distressed jeans and heels. I also spotted these which are a knock off of the designer version (over $700). I’ve been so much better about this for the last two years. I find something that will work for almost anyone and stock up. Whether it’s a cozy blanket or a pretty smelling lotion, it’s nice to have a few extra on hand. It eliminates so much stress when the unexpected invite pops up or when someone stops by unannounced. And if it’s something that can be used year round, it will never go to waste if you end up not needing it. This cozy blanket from Nordstrom receives five stars from me. It comes in one million different colors, is a great price point, and is ridiculously soft. 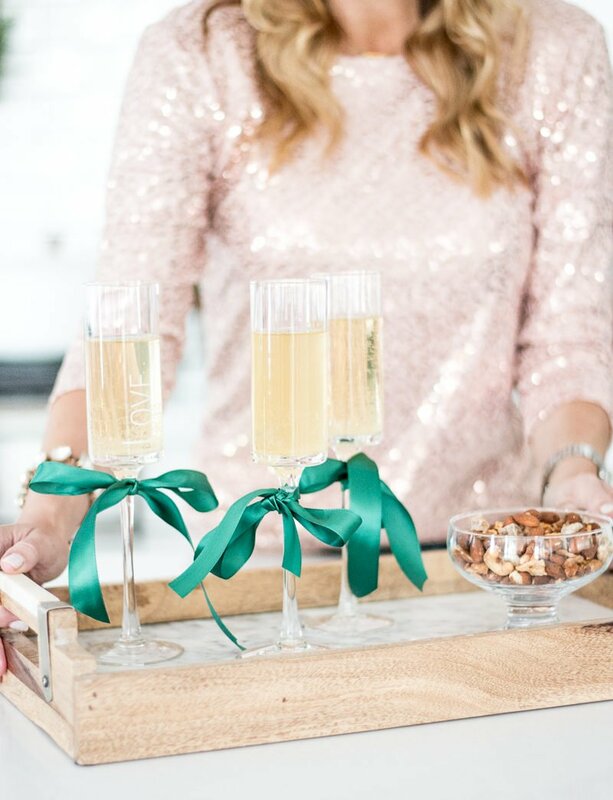 Rolled up with a beautiful bow, it’s a great teacher or hostess gift, too. The jammies are equally soft and comfy. The top is lower in the back so it covers your bum. Speaking of bums, the pants are low-rise in the back so be sure you’re good with that if you order them. I am wearing a size small. Raise your hand if you have ever shopped early and then completely forgot what you bought? I know I am not alone. I just had a dear friend tell me that she bought her husband two of the very same gift last year because she forgot all about the first purchase. Or maybe you know what you bought but can’t find where you put it. Worse yet you over spend because you can’t remember all that you bought. We’ve all been there. 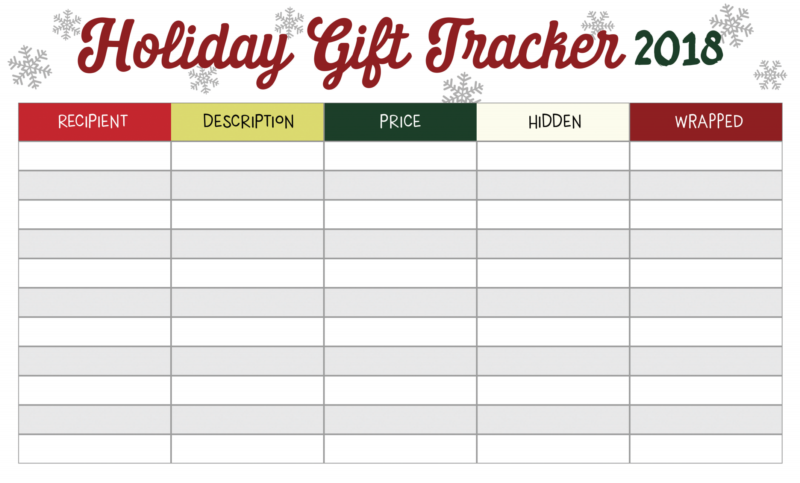 Because I am determined to finish my shopping early, I created a Holiday Gift Tracker. I hope you’ll find it useful. It allows you to jot down who you bought the gift for, how much it cost, where you tucked it away and if it is wrapped or not. If you do wrap early, be sure to put a post it note on the wrapped gift with what it is just in case. Bottom line, keep it simple and meaningful. That’s it. I’ve come to realize that people notice the little things when you don’t over do with crazy amounts of decor or over the top fussiness. Girls are coming over . . .tie a few drink glasses with a bow, put out some snacks and clean the kitchen. Done and done. By the way, satin ribbon is your holiday best friend. No joke. I use it for wreaths, stemware, gifts and the backs of chairs. It makes everything look more elegant. I hope these tips are helpful and allow you to slow down and enjoy the beauty of being together this season. Speaking of together, I am off to see my sweet mom. Look for our time together on stories. Have a wonderful day. Don’t forget you can access my gift guides under “2018 holiday shop” at the top of my blog. *Proud to partner with Nordstrom to bring you these tips. Affiliate links used. I have a date on my calendar with my girlfriend next month for Hallmark Christmas movies and baking. Looking forward to that amidst the more formal gatherings. I love the wreath above your stove. Could you share where you found it? That is AWESOME. I watched my first ever Hallmark holiday movie on the plan from Nashville. I think it was called Christmas Joy. I am officially hooked. Love that idea. The wreath was a lucky find from Target last year (Magnolia line). 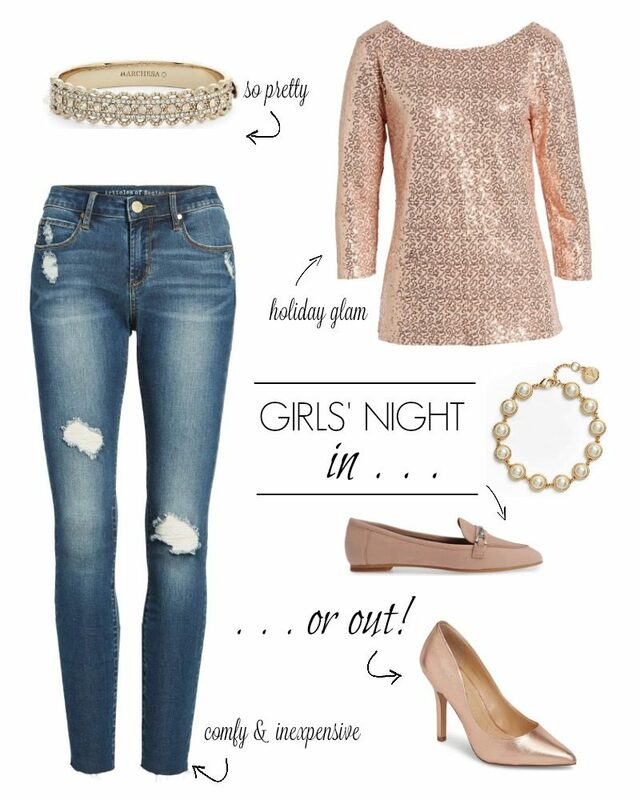 Love these ideas and all of the holiday outfits! Great post. Will you please sure your source of those fantastic glasses? Cute! Those jammies tho! I’m dead. So, so cute! ALWAYS so gorgeous my friend – love these three looks on you! !